On July 12, China's electronic information industry association was held in AnShun,GuiZhou and the list of "2016 (30th) China's Top 100 Electronic Information Enterprises" has been released. Our company again stood on the list,relying on comprehensive strength. 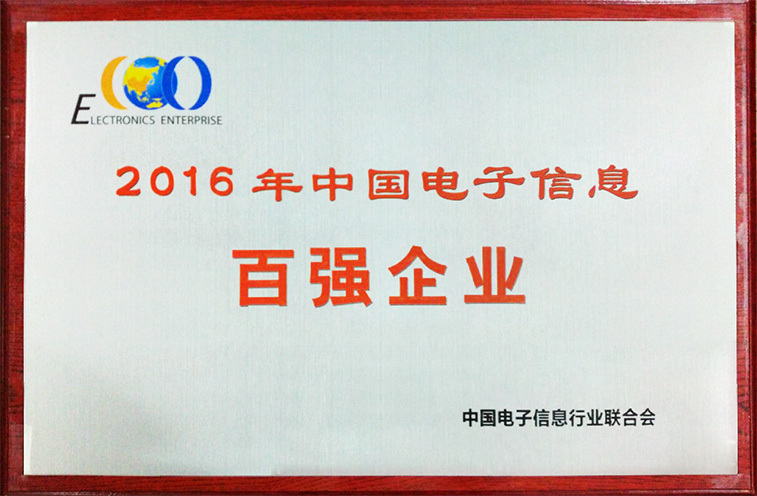 So far, we have seven consecutive terms among China's Top 100 Electronic Information Enterprises. It is understood that the selection of China's top 100 enterprises adopts comprehensive evaluation and investigation by analyzing the index of scale, efficiency,R&D innovation and social responsibility,finally gets out of the comprehensive weights evaluation of each enterprise. Among them,scale includes asset and income;Benefits includes enterprise's profit ability, development ability and management ability, etc. ;R&d innovation includes R&D investment proportion and the number of patents.Figures showed that the main business income from 2015 top 100 enterprise is 2.96 trillion yuan, increased 32.0% than the previous term.The total profit reaches 192.2 billion yuan, increased 34.6% than the previous term .Research and development investment amounted to 175.6 billion yuan, which was 41.6% higher than the previous term.The new term top 100 electronic information enterprises show six big features overall:fast rising of enterprise scale, efficiency level increased continuously,remarkable achievements of R&D innovation, international competition strength enhanced, the transformation and upgrading of enterprises promoted orderly, magnificent contribution to economy and society.KTC has been staning among the China top 100 electronic enterprises for seven consecutive years,which fully embodies that our comprehensive development strength recognised by the industry authority and KTC plays a positive role in promoting social and economic development . In recent years, facing with continual change in new situation, new demands and new tasks, we always adhere to independent innovation road, realized all-round improvement in the scale, efficiency, technology and brand.In the future,we will continue to adhere to the business philosophy of "quality is root, sincere service", constantly enhance our comprehensive competitiveness,make an efforts to maintain its leading position in the development of industry, try to produce high quality product stood test of time to give back to society.